Before I begin talking about social media strategies among sportswear brands, I want my readers to know that I’m a serial yoga pants wearer – both to the gym and to the workplace. I swear by how comfortable they are and how versatile they can be. With that irrelevant, useless information about my passion for yoga pants, let’s begin! In this blog post, I’m going to be looking at best practices for sportswear brands around the holidays. And to do that, I’m traveling with the Ghost of Christmas Past (aka Unmetric Analyze which is basically a time machine since it holds historic data of over 100,000 brands since 2012) to see what brands did in the last quarter of 2016 (Oct 1 – Dec 31, 2016). Using that data I’ll be making inferences and suggesting ways for brands to up their performance in 2017. The brands I’ve analyzed include: Adidas, Adidas Originals, Adidas Running, Asics, Fabletics, Just Fab, Nike, Nike Basketball, Nike Court (Tennis), Nike Football, Nike Sportswear, Nike+ Run Club, Puma, PUMA Football, PUMA Running, Reebok, Reebok Classic, Reebok Training, Under Armour,Under Armour Football, HEAD Tennis, Wilson Tennis, Under Armour Women, NikeWomen, Lululemon, Outdoor Voices, Reebok Women, Adidas Women, Converse, Jordan. To start with, I looked at posting frequency and engagement on Facebook. JustFab posted more in the last three months of 2016 than any other brand. However, it was Reebok Women that engaged the best while Jordan got the most Likes, Comments, and Shares. A closer look at Reebok Women showed me that a large part of their success was owed to a campaign with Gigi Hadid. I also noticed that a large portion of the posts were promoted. And for Jordan, this was the post that brought in the most Likes. While all this is about regular content, I used Share of Voice to understand how these brands performed around the holidays. Unmetric’s Share of Voice feature allows you to search for one or many keywords to see how content performed for those specific topics. I searched for Halloween, Thanksgiving, Black Friday, Christmas and New Year. 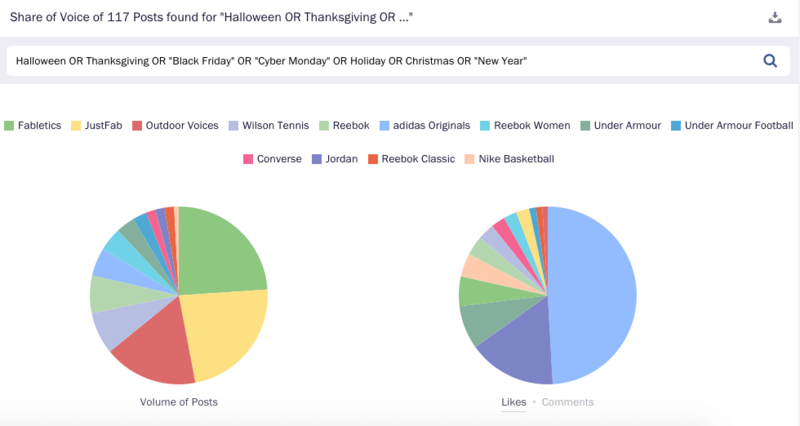 Of 1,630 posts that these 30 brands put out between October and December, 139 were about these holidays. One of the key trends I noticed was that most of these holiday posts weren’t just greetings. They were all motivational posts or offers to keep their subscribers active even during the holidays. As someone that struggles with finding the will to move during festive occasions, I know how such posts can be encouraging! Holidays are all about gifts. What better way to celebrate than with a good discount! The brand took a more informal approach and asked this question. Nike Court even launched a holiday collection in conjunction with Rafael Nadal. As we can see with Nike Court and Under Armour, celebrity endorsements were common amongst these brand posts too. Just using the Reebok post as an example, see how a post from the same campaign got way more interactions on Instagram. The post on Facebook has a little over a hundred Likes, while it has over 13,000 on Instagram. On Instagram, Adidas posted fewer pieces of holiday content compared to other brands, but they received the most Likes. Most content that topped the charts were about their holiday apparel range created in conjunction with Pharrell Williams. Seeing these content pieces and looking at more on the Unmetric Analyze platform, I was able to find what was working for these brands. I’ve summarized a few of the most popular themes and trends found in the holiday content from sportswear brands. Not only were these themes popular, they were also what performed best. Highlight your collaboration with a celebrity and have them endorse your holiday line. Motivation is big this time of the year. Not only does your audience need that extra push, it’s also a good segue into what your brand has to offer. Discounts during the season of gifts. Need I say more? Pick the right social network to maximize interactions and possibly reach too. For the sportswear brands analyzed, Instagram definitely seemed to work better than Facebook. There you have it. A few simple inclusions seem to be making all the difference for these sportswear brands. If you’d like to get more insights and data for your holiday content, you can find out more about Unmetric Analyze by signing up for a demo here.